Weatherill Brothers offers you the very best Marquee Hire Ipswich will ever see… so if you have an upcoming event in the Ipswich area, call us to find out more! There are several reasons you should consider Marquee hire for your Ipswich event or venue. If you have the land available, a Marquee can save you a considerable amount of cash. Instead of hiring a venue for the day you can hire a Marquee and enjoy all the benefits that go with it. You’ll be able to have as many guests as you like because we can always supply a Marquee to fit them. You’ll be able to choose the caterers you want rather than relying on the venue’s kitchen. You’ll be able to decorate or theme the Marquee exactly how you want to (speak to us about linings, flooring, lighting, themes etc) and you’ll be able to party later into the night too. If you’re an Ipswich venue owner and you’d like us to install a permanent Marquee at your Hotel or Pub, please get in touch on 01953 882394 and let us work with you. We will show you how to make a Marquee work for you and your premises, increasing your turnover and your bottom line. Weatherill Brothers have been hiring Marquees in Ipswich and the rest of East Anglia for many years so we know how to help you get the most from your event. We’ll deliver to your event site, set up according to your timescales, help you with all the things you need and give you attendants on-site too if you need them. We know putting on events isn’t easy, so we aim to help alleviate as much of the stress as we can so you can enjoy your night. 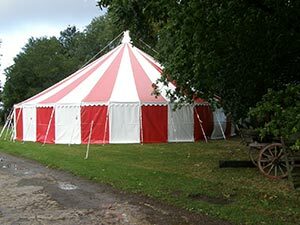 Call us today on 01953 882394 with any questions you may have about Marquee hire in Ipswich.